Everybody knows we live in a time of economic crisis. This may make us feel restless and insecure. But it also prompts a question that in the midst of our prosperity we may have forgotten to ask. To what end are we on earth? What is the meaning of our existence and where are we headed? A few pages from a medieval manuscript can help us to ponder these questions. They can be found in the Beatus Facundus, an illustrated commentary on the last book of the Bible, the Book of Revelation, which was made in 1047 for the Spanish king and queen. The first illumination is a colourful square with stylized figures. To unravel what is portrayed here we need to take a look at Revelation 21. There we read that John, the author of the book, is led by an angel to a high mountain from where he can see the holy city of Jerusalem descending from heaven. 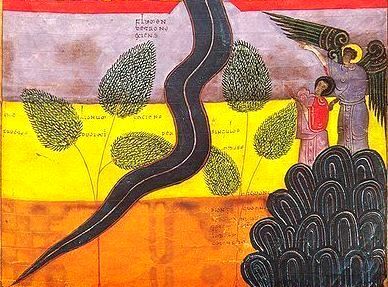 The Beatus Facundus gives us a bird’s eye view of the city, letting us look at it from above, as John sees it. The miniaturist painted a city in the architectural style of 11th-century Spain. With tile-chequered tableaus and horseshoe-shaped gates he attempts to suggest the splendour and golden glow of the city. He follows John’s description in detail: the length and the width of the city are the same and in the walls there are twelve open gates with angels in them. For the names of the apostles and of the precious stones that adorn the walls he uses inscriptions. Within the walls we see God and the Lamb with the cross, while the angel who showed this beautiful sight to John is seen measuring the city. The second illumination is just as colourful and stylized. It is made up of several horizontal bands. Here the first part of Revelation 22 is portrayed. At the bottom to the right the angel gives John another view of the city from the mountain. As we look along with him we see God on his throne, surrounded by people who honour him and who themselves are also sitting on thrones like kings. From God’s throne a thin and undulating figure is making its way to the bottom of the page. It is a river flowing through the middle of the city with trees on both sides. The inscriptions tell us that the water gives life and that each month the trees yield fruits that give healing. What can these miniatures mean to us in our time? They give us a glimpse into the ultimate goal of the history of the world as described in Revelation: God and humans living together in the celestial city. They stimulate us to imagine how glorious this will be. At the same time they urge us to consider that the purpose of our own lives here and now is connected to that final destination: a life with and for God. The images we as humans create fall short. How could we portray all that John describes? That there will be no more death, mourning, lamentation and pain? How can we show that the curse and night will be no more? And above all: does the lustre of God’s light which makes sun and moon redundant not far exceed our imagination? Beatus Facundus.Beatus of Liebena was a monk who lived in the 8th-century kingdom of Asturia in Northern Spain, the only part of Spain that was not ruled by the Islam. On the basis of texts by early Christian writers Beatus compiled a commentary on Revelation. He divided the Bible book in 68 storiae and between the text and the commentary on these storiae he placed illuminations. In this way he probably wanted to help his fellow monks to enter the text and meditate on its meaning for their own life and the future of the earth. After all, this book deals with the history and end of the world. 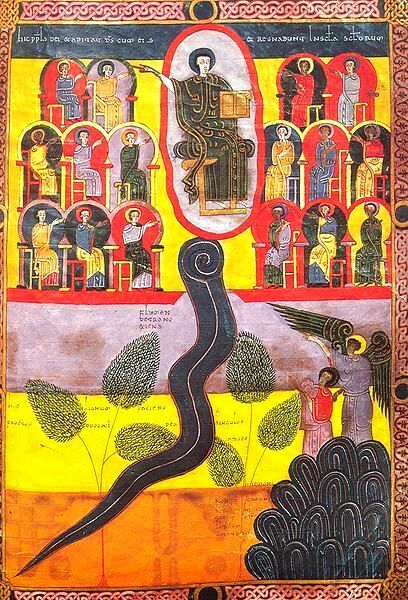 In line with this Beatus also included genealogical tables of Adam to Christ, a map of the world, and a commentary on the book Daniel. 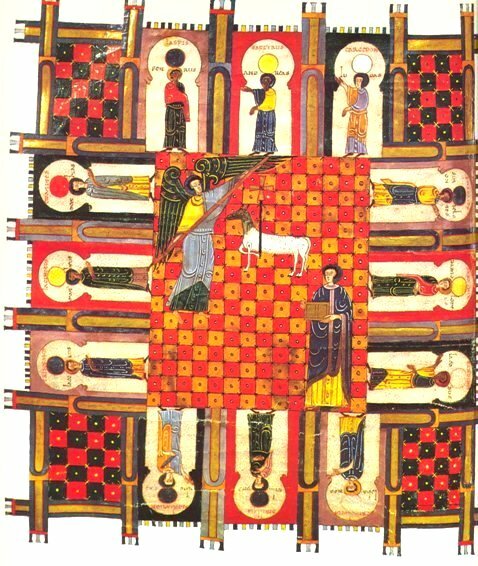 In the following centuries the Beatus manuscript was often copied in other monasteries in the Christian part of Spain. The style of the copyists makes clear that they were not only familiar with French art but also with the Islamic art of their time. Each illuminator built in his own way on the work of his predecessors. So too did Facundus who made a copy in 1047, this time not commissioned by a monastery but by King Ferdinand I and Queen Sancha. His manuscript, the Beatus Facundus, is one of the most well-known and most beautiful.